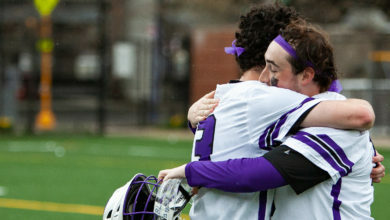 The Emerson men’s lacrosse team began conference play in the New England Women’s and Men’s Athletic Conference with a tough 28-6 defeat to Springfield College on March 30 after losing multiple key players to injuries early in the week. 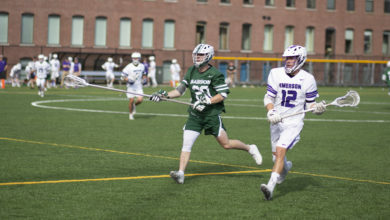 In Emerson’s 10-6 loss to the University of Massachusetts Dartmouth on March 28, freshman defender Spencer Clark suffered an ACL injury that will sideline him for the remainder of the season. Junior Bailey Kennedy—the team’s only goalie—suffered a concussion that kept him out of the Springfield tilt. Freshman defender Jiwon Kim also left the game in a walking boot following a nasty collision late in the second half. Head coach Matthew Colombini said he’s had no trouble finding replacements for the players that are out. Freshman defender Lucas Sickner stepped up to replace Kennedy in goal for the game against Springfield and made six saves. Colombini said Sickner volunteered to play goalie even though he hadn’t played in net since his middle school lacrosse days. Junior attackman Cameron Radenberg said the team’s spirits remain high despite losing multiple key players in quick succession. The Lions got off to a solid start in nonconference play, going 4-3 to open the season outside of the NEWMAC. The team picked up their first win in a 13-12 double-overtime contest against Mount Ida College in the season opener. Junior attackman Jared Brush led the Lions with five goals. Radenberg said although they were successful in their nonconference games, their upcoming NEWMAC games would be no easy task. Colombini said he wants the team to continue to build on what worked during their nonconference games to help the team succeed in the NEWMAC. 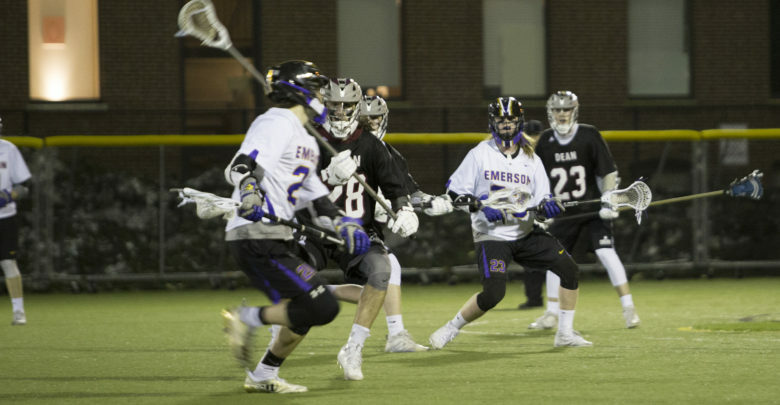 Emerson’s attack is off to a hot start this season thanks to strong performances from Radenberg, Brush, sophomore Austin Franklin, and freshman Joe Meyers. Radenberg leads the team in points with 27 off of 11 goals and 16 assists, while Brush leads the team in goals with 17. All four attackmen combined for 69 points in the team’s opening eight games. Colombini said the success from his attack comes from the team’s playing style. 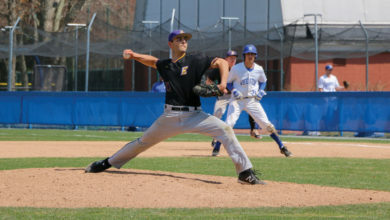 The Lions added a number of fresh faces to the squad this season, with eight freshman and three sophomores playing their first seasons in Emerson jerseys. Meyers and freshman midfielder Stevie Powers have played key roles on the team and find themselves in fifth and third in scoring on the team respectively. Powers is fourth on the team in goals and third in assists, while Meyers is second in assists. Colombini said while newcomers occasionally show their inexperience, this year’s crop is finding success in important roles. 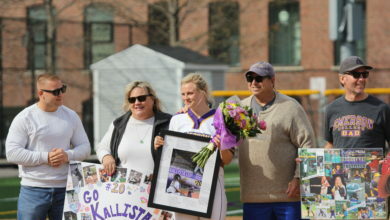 Emerson is 0-1 in NEWMAC play. Going forward, the Lions have six more conference games and two nonconference games against the State University of New York at Purchase and the University of New England. Radenberg said the team’s goal this season is to beat Massachusetts Maritime Academy, a team Emerson lost 14-10 to on the final day of the 2016-17 season. The Lions next face nonconference opponents Purchase on April 4 at Rotch Field. The game is set to begin at 6 p.m.